Tekezze Hydropower Plant, which is expected to curb the severe shortage of electricity in the country, is going to be officially opened next week on November 8. Tekezze, whose 44 metre arch dam is the biggest of its kind in Africa, started production of 75 megawatts in mid-August as a test trial. The dam has four turbines each with a capacity of generating 75mw. When fully operational, it is expected to add 300mw of much needed power to the national grid, increasing generating capacity to a total of 1,170mw. The current power demand in Ethiopia is 1600mw. 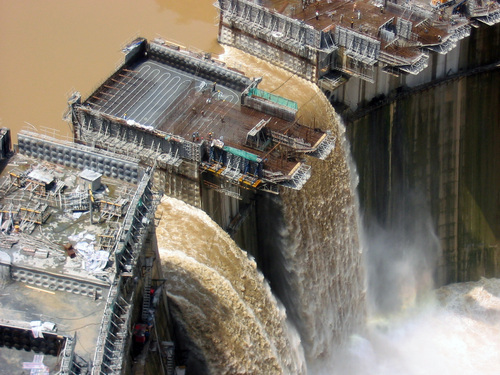 The Ethiopian Electric Power Corporation (EEPCo) signed the contract to construct Tekezze on June 7, 2002, with the Chinese National Water Resources and Hydropower Engineering Corporation (CWHEC). The completion date was originally in 2007, but the project has been beset with unforeseen problems.